The elementary school of Hospitaliers St. Gervais is situated in a small street by the same name in the heart of the Marais quarter in Paris. What is today a very chic part of town was known as "the Pletzl"— the Jewish quarter, where many Jewish immigrants from Eastern Europe settled. The school itself was originally a Jewish school, established in 1846. The remains of the old inscriptions are still visible on the building. Although it became a public school in 1880, most of the students continued to be Jewish. The boys' school was at number 6 and the girls were next door, at number 10. During the Holocaust 165 of the children of the Hospiteliers Saint Gervais School were deported. None survived. Soon after their arrest in July 1942, they were separated from their parents. For some reason the Eichmann office in Paris sought permission from Berlin to deport young children to Auschwitz. There were no such scruples in what concerned their parents – the transports with the adults began rolling immediately, while their children were interned in camps. A month later, in mid-August, the authorization was given, and the Germans began to add groups of children to the transports that were by then regularly leaving for Auschwitz. In result, prior to their murder, these children had to endure the horrors of internment and deportation all alone without their parents. Joseph Migneret, had been teaching at the school of Hospitaliers St. Gervais since 1920 and was nominated as principal in 1937. The roundups of the Jews practically wiped out the school. When he heard of the deportations and his students, his former students and their families turned to him for help, he did not merely sympathize with their plight, but decided that the situation called for action. He became active in an underground network that provided false papers and aid to Jews on the run. He helped his students and their families in any way he could. One family testified that he hid them in his home for a long period of time. Based on the testimonies of his former students, Joseph Migneret was honored as Righteous Among the Nations by Yad Vashem in 1990. A tree was planted in Migneret’s honor at a very symbolic location – close to Yad Vashem’s Children's Memorial. The tree faces the memorial of another great educator – Janusz Korczak, the Jewish writer and pedagogue who did not abandon the children in the Warsaw Jewish Orphanage that he headed and went with them to his death in Treblinka in August 1942 – about the same time that Migneret began his rescue work. 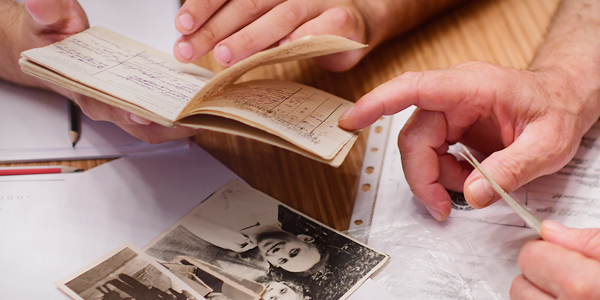 In June 2009, almost twenty years after Joseph Migneret was recognized as Righteous Among the Nations, the Department of the Righteous received a letter from Shlomo Fischer-Shenkar of Ramat Gan, Israel. Apologizing for making the request so late, the Shlomo expressed the wish to honor the principal of his school, Joseph Migneret. When he was told that Migneret had already been included in the list of the Righteous, he broke out in tears.